Finkel Review on the Electricity Market – What Happens Now? Fifty Years of the NPWS but is Anyone Celebrating? Male superb fairy-wrens change colour every year, from dull brown to bright blue. But being blue may be risky if you are a tiny bird that is easily spotted by predators. This new study found that male fairy-wrens adjust their risk-taking behaviour after undergoing colour change, becoming more cautious while brightly coloured. For many males, having beautiful colours is important for attracting choosy females. Researchers think attractive colours come with a cost, so that only the highest quality males can afford to display them. This may be helpful to females looking to select the best mate. One possible cost of bright colours is increased predation risk, as bright animals are easily seen in their natural habitat. This cost can be dramatic (i.e. being eaten) but may more often involve changes in behaviour to mitigate risk, such as spending more time scanning for predators and being more responsive to perceived threats. Such behaviours are costly because they reduce the time available for foraging and are energetically expensive. A relationship between bright colours, predation risk and cautious behaviour may seem intuitive; however this is difficult to test. This is because different coloured animals may also differ in their age, size, escape tactics and personality, which can influence both their behaviour and actual predation risk. To address this, we tested whether individuals adjust their response to risk according to changes in their plumage colour. Superb fairy-wrens are small, charismatic songbirds. They live in groups with a dominant male and female and, often, several younger males. These birds are vulnerable to predators such as kookaburras, butcherbirds, currawongs and goshawks. When a group member spots a predator, it gives an alarm call to warn the others. In response, other group members may race for cover, or ignore the alarm and continue about their business. Male fairy-wrens change colour by replacing dull brown feathers with bright blue, black and indigo ones prior to breeding, turning brown again after the breeding season is complete. Individuals change colour at different times of the year, ranging from the Australian autumn (March to April) to late spring (October). Although female fairy-wrens have a stable, social partner, when egg-laying time comes, they briefly leave their territory under the cover of darkness and “visit” the male who became blue earliest in the year. Many of the females in the surrounding area prefer the same male, who may father around 70% of the offspring in the neighbourhood. These attractive males are blue for longest (remaining blue for 10-12 months of the year) and so may face the greatest risk of predation. 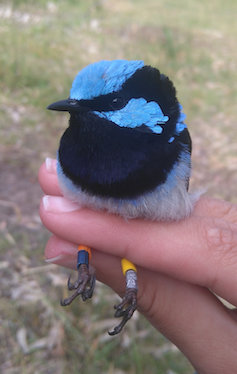 We gave fairy-wrens different coloured leg bands, allowing us to follow the same individuals over time. We compared the behaviour of the same males while they were brown and blue, as well as males that remained brown or blue throughout the study. This meant we could test for the effect of colour on responses to perceived risk while accounting for individual differences and possible seasonal changes in behaviour. We estimated cautiousness in the birds by testing their response to alarm calls. This involved sneaking up on unsuspecting fairy-wrens in their natural habitat and broadcasting fairy-wren alarm calls from portable speakers. We used two types of alarms: a low-danger alarm, which warns of a moderate threat, such as a predator that is far away, and a high-danger alarm, which signals an immediate threat. Responses to the low-danger alarm included fleeing for cover, an intermediate response (such as ducking or looking skywards) and no response, when the alarm was ignored. Fairy-wrens fled immediately after hearing the high-danger alarm, but differed in the time taken to return to the open. 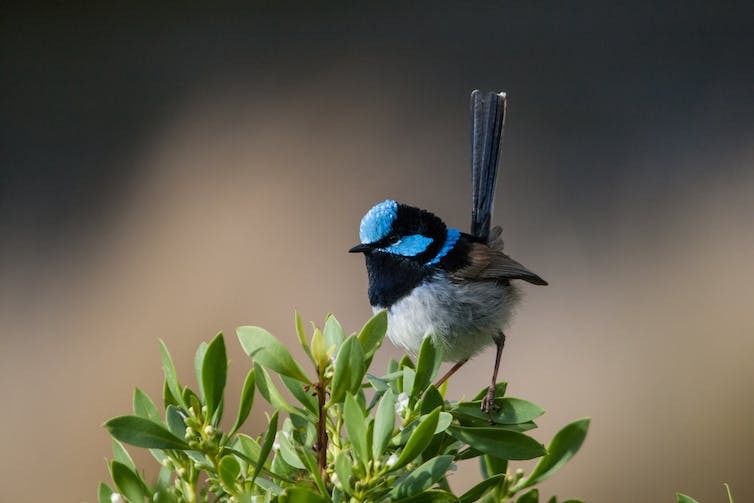 We found that fairy-wrens were more cautious while blue; they fled more often after hearing low-danger alarms and took longer to emerge from hiding after fleeing in response to high-danger alarms. Blue fairy-wrens also spent more time scanning their surroundings and less time foraging compared to brown wrens. This suggests that fairy-wrens perceive themselves to be at a higher risk of predation while bright blue and adjust their behaviour accordingly. Intriguingly, fairy-wrens also adjusted their behaviour according to the colour of other wrens in the group. When a blue male was nearby, wrens were less responsive to alarm calls and devoted less time to keeping a look-out. Perhaps this is because fairy-wrens view blue group members as colourful decoys in the event of an attack. This could occur if predators are biased towards attacking the most conspicuous animal, which reduces the predation risk for surrounding individuals. Brown wrens could also be taking advantage of the greater time blue males spend scanning, allowing them to lower their guard. Being blue for longest gives males the best chance of attracting females, but they need to be extra careful lest they get eaten before it comes to that. Coauthors on this research are Annalise Naimo, Niki Teunissen, Robert Magrath and Kaspar Delhey. It also had to be politically palatable for the federal and state governments. The energy users, the general public and industry just want long-term policy certainty. The major points made by the review and the Climate Council’s view are summarised below. The minimum target for reducing emissions in the electricity sector should be a 28% emissions reduction below 2005 levels by 2030. While it places responsibility for more aspirational targets to 2030 and beyond with government(s), the review cautions higher targets could have ‘larger consequences for energy security’ and ‘implications should be re-examined’. This target is consistent with the commitment made by Australia at the Paris Climate Change conference but the electricity sector needs to bear a greater share of the reduction. It is easier to reduce emissions in the electricity sector as many of the required technologies already exist and reductions in other sectors like transport and land use are harder to achieve. The Climate Change Authority, the government appointed advisory body, suggested that electricity emissions should reduce by two-thirds by 2030 and be zero by 2050. The Finkel Review proposes introducing a Clean Energy Target, which would effectively replace the current Renewable Energy Target from 2020. Gas and coal (with carbon capture and storage) would qualify under the Clean Energy Target, as well as renewable energy. The Clean Energy Target would set a certain target amount of new ‘clean’ electricity (expressed as GWh or % of electricity) based on the required emissions reductions for the electricity sector. The Finkel Review leaves the target baseline and emissions trajectory to 2030 and beyond for politicians to decide. Technologies with lower emissions, like renewables, would receive higher benefits than those with higher emissions, like gas and coal (which would still be required to be below a set emissions intensity level to receive any benefit). New coal stations that do not meet the target can still be built without penalty, increasing the emissions reduction burden from ‘clean’ electricity. The Clean Energy Council website explains this mechanism in more detail. Modelling undertaken for the Finkel Review (based on 28% emissions reduction for the electricity sector) indicates the Clean Energy Target mechanism (and an emissions intensity scheme) would result in lower costs to households and businesses compared with no action at all (business as usual). The modelling shows renewable power continuing to grow, up to 42% of electricity supply by 2030 (58% still comes from fossil fuels by then, with no further brown coal closures), in contrast to business as usual of 35% renewable electricity. Power generated by renewable energy in 2030 under the proposed Clean Energy Target – at 42% – is far too low. Under the Clean Energy Target, electricity supply from large scale renewable energy would only increase 9% from 2020–30 (about the same increase as has occurred in the past ten years, a decade marked by significant climate and energy policy uncertainty). The Finkel Review recommends a new requirement on new wind and solar power plants to provide a certain level of ‘dispatchable’ capacity (this was called a Generator Reliability Obligation). Dispatchable capacity is electricity that is available on call, as and when needed. New wind and solar would be required to provide a certain amount of battery storage or gas generation as determined by energy market bodies so that power is available with certainty, for example, when the wind isn’t blowing and other sources cannot provide sufficient power. There was no equivalent requirement placed on new, or existing ageing gas or coal generation, despite the failure rate of ageing power stations increasing. For instance, in early February 2017, a severe heatwave across much of Australia’s south east and interior caused supply issues for the South Australian and NSW energy systems at a time of peak demand. In NSW around 3000 MW of coal and gas power capacity was not available when needed in the heatwave. High power users in industry were required to scale back production at great cost. The Finkel Review recommendations focus on incentives to encourage new lower emissions power plants to be built, rather than phasing out or penalising polluting coal and gas plants. So the approach is intended to bring on new renewables without incentivising the phase out of existing polluting coal generators. Coal generation would continue to provide over 50% of Australia’s electricity by 2030 and 24% by 2050. … approximately 68% of the current coal generating plants will have reached 50 years of age. Its modelling shows most still operating at 2030 and some even by 2050. The review even considers it a ‘benefit’ for these old, polluting coal plants to continue operating. The key recommendation for coal-fired power is a new requirement for power plants to provide three years notice before closing. A schedule for the closure of aged plants should have been established years ago. The Finkel Review provides for a continuing role for gas power generation despites the issues with methane emissions and local environmental impacts of coal seam gas extraction. It acknowledges gas prices (and, as a result gas power prices) will continue to rise in future due to the demands of liquefied natural gas exports from Queensland, and the increasing price of producing gas from unconventional gas fields. At current gas market conditions, it observes that battery storage may be more cost effective than gas in providing security and reliability in the near future. However, the Finkel Review paradoxically urges government and industry to prioritise gas exploration and development. See STEP Matters Issue 190 for more details on the issues with gas powered electricity. The Turnbull government has supported all the recommendations except the Clean Energy Target. They can’t get away from the vested interests of the coal industry. There are even rumours that they would consider providing financial support for a new ‘clean’ coal-fired power plant. Coal-fired power is on the way out, globally, and in Australia. Clean coal is very expensive, if not technically impossible. But using public funds to prop-up this 19th century technology would lock in climate-destroying pollution and higher power prices for decades to come. The states are setting strong targets that will help Australia reach net zero emissions by (and ideally before) 2050 in order to protect Australians from worsening climate impacts. South Australia is about to get a 150 MW solar thermal power plant that will meet 5% of the state’s power needs. The 150 MW plant near Port Augusta is expected to be operational by 2020 and will power all the South Australian government's electricity needs. The plant uses the sun as a source of heat that is reflected by mirrors onto a tower containing molten salt that is used to create steam that drives a turbine. It is expected that more of these plants will be built. Several local governments including Ku-ring-gai, Willoughby and North Sydney, have signed up with the City Powers Partnership set up by the Climate Council. Local councils who join the partnership pledge to take five key actions across renewable energy, efficiency, transport and working together. The partnership acts as a support network for sharing expert information and establishing joint projects. The information in this article is sourced from the Climate Council’s commentary called Unpacking the Finkel Review. One of the major concerns about the NSW government’s biodiversity laws is the fundamental flaws in the Biodiversity Offsets Scheme, which will lead to the widespread clearing of remnant bushland in the Greater Sydney area, in return for developers' cash payments – see STEP Matters Issue 191. The application of these payments is unlikely to make up for the biodiversity that is lost. Several groups are so concerned that they have written a joint open letter to the premier. It is not only environment groups involved. Others are the Heart Foundation, the Institute of Landscape Architects and the National Trust. The letter (see below) calls for action from the government to make the rhetoric a reality that the legislation will improve biodiversity within Sydney. Members of the general public are invited to sign the letter. With Sydney’s population projected to grow to 6.4 million by 2036 and the worsening climate change-related urban heat island effect, we write to urge you to ensure that adequate levels of green space are provided to all Sydney-siders and Sydney’s unique bushland and wildlife is protected. Sydney-siders highly value access to a range of formal and informal green spaces – trees, bushland, parks and sporting fields. This is borne out in previous public surveys and the strong community reaction whenever public green space is sold-off or alienated for development. Extensive research, both in Australia and overseas, clearly shows that the environmental, social, spiritual and economic benefits of green spaces are irrefutable. Green spaces cool our city, reduce energy costs, increase property values, promote healthy lifestyles, improve air and water quality, reduce net carbon emissions, prevent stormwater runoff and provide important wildlife habitat. Sydney's green spaces also play a key role in the health of Sydney's iconic blue spaces. For example, the revitalisation and resilience of Greater Sydney's six major river systems – Hacking, Georges, Cooks, Parramatta, Nepean and Hawkesbury, as well as Botany Bay and Sydney Harbour depends on the health and connectivity of the surrounding vegetation. Despite these benefits, current NSW government policy and legislation is failing to protect Sydney’s green spaces as these are actively being depleted by clearing and alienation for grey urban and industrial infrastructure development. The Total Environment Centre’s SOS Green Spaces map highlights over 70 green spaces currently at risk of destruction. This includes peri-urban areas undergoing rapid development and the impacts of major transport infrastructure projects such as the South East Light Rail and WestConnex. This deteriorating situation must be addressed as a matter of urgency. A Plan for Growing Sydney Direction 3.2 aims 'to create a network of interlinked, multipurpose open and green spaces across Sydney' also known as the Green Grid. This concept is also supported by the work of the Greater Sydney Commission. However, specific actions, policies, legislative changes and funding are required to shift this concept from rhetoric to reality. Assign responsibility for planning, implementing and monitoring Sydney’s green spaces to an independent body with the mandate, skills, funding and resources to achieve a comprehensive network of formal and informal green spaces designed to maximise benefits to Sydney-siders and protect Sydney's unique bushland and wildlife in the long-term. Prevent the clearing of bushland in the Greater Sydney area unless strict like-for-like offsets can be located and protected in perpetuity within the close vicinity of the bushland being cleared (note: under the government’s current draft Biodiversity Conservation Regulation 2017, the proposed Biodiversity Offsets Scheme will lead to widespread clearing of Sydney’s remnant bushland, including threatened species habitat, particularly in Western Sydney). Prevent the alienation of community and Crown land, as well as removal of the tree canopy, from Sydney’s green space network. Sydney's green spaces are a vital component of its liveability and resilience as a city. Your positive action in protecting and enhancing our green spaces would strengthen your leadership in Australia’s much-loved and admired iconic first city, for current and future generations. We, the sixteen signatories to this open letter look forward to an opportunity to discuss this important issue further with you. The NSW government thinks that raising the spillway wall of Warragamba Dam by 14 m will significantly reduce the risk of floods inundating homes in western Sydney. But experts have questioned whether the raising will achieve worthwhile benefits and whether the ecological damage can be acceptable. They argue the water levels in the dam storage should be better managed instead. The first water supply dams built to supply Sydney were the Upper Nepean dams (such as Avon and Cataract Dams) that still provide 20-40% of our supply. When this supply became inadequate the next step was the construction of Warragamba Dam that commenced in 1948 and was completed in 1960. The resulting storage in Lake Burragorang is one of the largest reservoirs for urban water supply in the world. Following 1988 and 1989 high rainfall years, the NSW government re-evaluated the potential rainfall and flood risks and raised the dam wall by 5 m and constructed an auxiliary spillway on the east bank of the dam. Back in February 2007 the Warragamba Dam water supply fell to its lowest recorded level of 32.5% after the prolonged drought from 1998. In response conservation measures and water usage restrictions were introduced. The desalination plant was built at Kurnell but this has hardly been used as we have had a period of above average rainfall ever since. Now the concern is flood risk. In 2012 and 2015 water had to be released to prevent a mass overflow. Currently the level is around 91%. The benchmark for flood risk often used is the worst recorded flood that occurred in 1867 when the water height at Windsor Bridge was 19.2 m. This figure (from Sydney Morning Herald) provides data of past major floods and the flood extent in 1867. According to the State Emergency Service, the estimated rainfall in 1867 in the lead up to the flood was 770 mm over three days averaged over the entire Nepean River catchment. The flood experience would be different now because several dams have been built in the Nepean catchment. The high rainfall experienced in 2013 led to the need to release water causing minor flooding. The NSW government initiated another Hawkesbury Nepean Flood Management Review. The review concluded that there is no simple solution or single infrastructure option that can address all of the flood risk in the Hawkesbury Nepean Valley floodplain. The risk will continue to increase with population growth. Evacuation is the only mitigation measure that can guarantee to reduce risk to life. According to the State Emergency Service a flood at the 1867 level would now lead to the evacuation of 90,000 people, damage to 12,000 homes and a cost of $5 billion. As Prof Paul Boon explained during his STEP talk on 11 July on the Hawkesbury River, the topography of the river valley creates several challenges in understanding and managing flood risk. The Hawkesbury has two main sources, the huge catchment of rivers that flow into Warragamba Dam that has its own flood plain from Emu Plains to Castlereagh. Then the Hawkesbury starts at Yarramundi when water sourced from the Grose Valley catchment in the Blue Mountains joins the Nepean. There is a flood plain around Richmond and Windsor through to Cattai but then more rivers join in and the valley narrows again with steep sandstone gorges and many twists and turns. This means that floods can bank up and spread out over broad areas of western Sydney. Due to time constraints the review only assessed the flood mitigation potential of raising of the Warragamba Dam wall crest by 15 and 23 m. Pre-feasibility construction costs and reduction of flood levels have been calculated. However, economic, environmental and social costs and benefits have not been included at this stage. Detailed cost benefit analysis will be conducted for the options for the raising of Warragamba Dam in Stage 2 of the review. The review also assessed the potential for changing the operation of Warragamba Dam at its current configuration to provide for flood mitigation. Options examined different ways to create airspace to capture a portion of incoming floodwaters, by reducing the full supply level of the dam, ‘pre-releasing’ water if major flood inflow are expected based on forecast rainfall, or ‘surcharging’ the dam level during floods using the dam’s gates. The review concluded that only minor floods, below levels where significant damages occur, could be mitigated using the current dam unless its role as the main water supply to Sydney was compromised. It was also concluded that ‘pre-releasing’ of water from the dam prior to a flood was limited due to the inaccuracies in rainfall forecasts beyond three days, and the potential to increase or prolong downstream flooding. 12 m lowering would have significant impacts on Sydney’s water supply. Stage 2 of the review will further analyse surcharging the gates and reducing the full supply level for the mitigation of smaller floods, including the operational risks and the impact on Sydney’s water supply. Even though Stage 2 of the review has not been completed, WaterNSW has been preparing environmental impact statements based on a proposal to raise the dam wall by 14 m and made a referral under the Federal Environment Protection and Biodiversity Conservation Act on specific matters of national environmental significance. The intended operation after the spillway wall is raised is for water to be held back during a heavy rainfall event and then released slowly in the following weeks. This will provide additional time for evacuation and reduce the downstream flood peak. The stated intention is not to increase the current overall water storage level. Raising the dam level does not deal with the flood waters coming from the major rivers further downstream such as the Grose, Macdonald and Colo. The extra water storage is intended to be temporary but the vegetation around Lake Burragorang and its tributaries that will, nevertheless, be flooded for several weeks will die leaving ugly scaring of the banks. The upstream flooding will impact the Kedumba and Colong River valleys that are part of the World Heritage listed wilderness areas. A further 1800 hectares could be flooded and another 33 km of rivers inundated. The backed up water in the Kedumba River will be visible from Echo Point, the iconic lookout in the Blue Mountains at Katoomba. The figure illustrates the projected increase in areas affected by inundation. Even flooding from a 1 in 50 year flood will extend 5 km into the Kedumba Valley and cause the death of 40% of the critically endangered Camden White Gum Forest. This species is listed as vulnerable under the Threatened Species Conservation Act. The Department of the Environment includes the forest in the Kedumba Valley as part of the Save Our Species biodiversity restoration program with an objective ‘to secure the species in the wild for 100 years and maintain its conservation status under the TSC Act’. Methinks WaterNSW should talk to the Department of the Environment. Aboriginal cultural heritage will be destroyed. Classic bushwalking areas will be lost, historic campsites drowned and access restricted. Bushwalkers are drawn to the pristine Kowmung River, a wild river that has inspired generations of walkers. Can the Water Storage Level be Managed Instead? Assoc Prof Stuart Khan, an expert in water engineering, disagrees with the need to raise the dam level. Management of the water level by controlled releases is a safer option so that the dam is never full. The desalination plant that can supply 15% of Sydney’s water needs, could be put to use when the need arises by way of earlier releases. Basically he disagrees with the review’s conclusions. Whatever option is taken flood risk cannot be eliminated. However the government is still going ahead with allowing massive population increase in the flood plains of the Hawkesbury Nepean system. As population grows the warning time needed to organise evacuation will increase. Given the improvement in longer term weather forecasting. The government must explore options for smarter use of risk management techniques to adjust the storage levels. Raising the dam wall ignores this potential and could be a waste of $700 million. Also future governments could easily be tempted to use the raised dam wall to increase water storage permanently to provide water supply for Sydney’s projected massive increase in population. As reported in the Sydney Morning Herald on 21 August, coal mining is impacting on the Sydney water supply catchments but the government is not carrying out adequate monitoring. The 2016 Audit of the Sydney Drinking Water Catchment was tabled in parliament on the quiet. The National Parks Association discovered the report. It revealed that groundwater losses from longwall mining under the catchments in the Woronora areas has not been quantified. This is despite mining company reports have indicated that about 25 to 40 million litres a day have been entering the mines. The 2013 audit report revealed that research was underway into the connectivity of surface and groundwater but no results have been revealed in the 2016 audit. This is not good enough given that these mining companies are still applying to expand their mining operations under the catchment. There are also problems with coal mines leaking toxic chemicals into catchment rivers. Examples are the Springvale mine that has been pumping untreated waste into the Coxs River and the closed Berrima mine that has been leaking pollutants into the Wingecarribee River. In the early days of settlement in NSW development decision-making took little heed of its impact on the environment, the loss of flora and fauna and associated ecological communities. In the 1970s, as human impact on our natural environment became more pervasive, a greater understanding developed of what was being lost and appreciation grew of our unique flora and fauna. Changes in attitudes led to the passing of legislation such as the Threatened Species Act, planning laws that include assessment of environmental impacts and the creation of the National Parks and Wildlife Service (NPWS). The NPWS was established in 1967, 50 years ago, when the Fauna Protection Panel that was constituted under the Fauna Protection Act 1948 amalgamated with the Parks and Reserves Branch of the Department of Lands. The purpose of the act was to provide for the protection and preservation of fauna, while permitting the destruction and control of those species which were harmful to primary producers. The act applied to all fauna whether native or introduced. The national park estate has been steadily increased over the years so that now 872 reserves and parks are under NPWS management. However the declaration of new national park areas has been reduced to a trickle in recent years. The area of the state represented is now about 9% of the total land area. NSW has fallen well behind in achieving its international commitments to biodiversity protection. As a signatory to the International Convention on Biological Diversity, NSW has voluntarily committed to protect, by 2020, at least 17% of terrestrial and inland water, and 10% of coastal and marine areas. There is a lot of catching up to do. It is hard to see these international commitments being met when the current government attitude is to treat the NPWS as a poor relation. There has been a steady reduction in funding since the Liberal National government came into power in 2011. Staff numbers have been cut through regular redundancy programs so that vital long-term experience has been lost in areas like remote area bushfire fighting and vegetation restoration. Staff have been subject to repeated structuring, the latest being a reduction in the number of regional managers from 14 to 8. Regional managers will now have impossibly large areas to manage. Funding has been diverted to eye catching new projects rather than repairing degraded facilities and heritage sites. … ongoing budgetary pressures associated with increasing costs and salaries, and decreasing expense allocations across future years … We need to be proactive in identifying and implementing opportunities for savings to be made and revenue to be increased, to ensure we can continue to implement our core conservation, emergency response and visitor services for the people of NSW. The savings are being imposed despite the NSW being in a bumper financial position following asset sales and booming stamp duty income. And yet the Office of Environment and Heritage website describes national parks as a ‘bedrock of nature tourism’. No wonder the government is making the 50 years anniversary a low key event! The situation is an embarrassment to a state with such magnificent natural areas that are a major drawcard for local and international visitors. The newspapers have been full of complaints about the deteriorating visitor facilities. The money is being spent on high profile development such as the mountain bike tracks in Garigal National Park and sports stadiums. The current executive of the Office of Environment and Heritage has refused a proposal to update a 2006, 40th anniversary document, made available through a freedom of information request, to mark the 50th anniversary. The document, NSW NPWS Commemorative History 1967–2007 was withheld, effectively suppressed, by the then Department of Environment and Climate Change executives when the authors refused to make requested changes. It has remained in draft form under copyright ever since. The treatment of national parks is consistent with other Baird/Berejiklian government decisions to reduce land clearing restrictions and threatened species protection and facilitate development with reduced standards for biodiversity offsetting. It seems care for the environment is not consistent with the politicians’ mantra of growth at any cost. The latest insult is the suggestion by the powerful Roads and Maritime that 60 hectares of the Royal be acquired for an extension to the F6 freeway from Loftus to Waterfall. The Royal is Australia’s first national park that was reserved for protection. It was formally proclaimed on 26 April 1879. To make matters worse there has been a push to have the Royal National Park inscribed on the World Heritage list. This process has widespread support from conservationists and the local communities. In July a technical obstacle to including the Royal on the World Heritage List was removed by UNESCO’s World Heritage Committee when they added a listing criterion of ‘an area of importance in world protected area history’ (Mosley 2012). If the land excision for the F6 goes ahead there would be little chance that the listing could be accepted. Over the past century, average land surface temperatures have risen by almost 1°C across the Australian continent. Models suggest this may have already had significant impacts on Australia’s ecosystems and biodiversity, but these impacts have not been systematically investigated. CSIRO Land and Water and the Department of the Environment and Energy are undertaking an exciting project to collect observations and anecdotes that will help to build a national picture of the kinds of ecological changes that have been occurring across the country over the past 10 to 20 years or more, and where changes may not have been occurring. We are looking for people with strong links to Australian environments (e.g. farmers, natural resource managers, ecologists, naturalists, rural scientists) to share their perceptions of recent ecological change (or lack of it) in an area they know well, and how this might link with climate or other change. The survey will take about 30 min. Click here for additional information about the project. A special resolution will be moved at our AGM to modify our constitution. In accordance with the constitution, official notice is hereby given of the proposed resolution. Click here for a copy of the proposed constitution and a brief summary of the main changes.